Grib won! 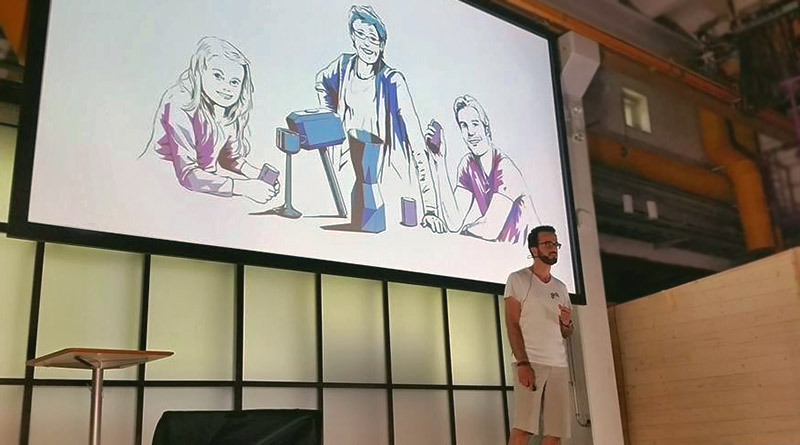 Maybe because we brought Thor, the god of thunder and lightning, on stage with a hammer we printed for him using Grib – a hilarious surprise for the audience at Summer of Startups (SOS) 2015. SOS chose 10 teams out of 100 applications to participate in their 9-week program. On Demo Day at Startup Sauna in Otaniemi, Espoo, all teams presented the results of a summer’s worth of hard work. Some of the teams drew more attention than the others with their work and concept, Grib among them. We also raised the highest level of expectations for becoming a successful startup. Summer of Startups (now Kiuas) by Aalto Entrepreneurship Society (Aaltoes) is an accelerator program for innovative teams to bring their ideas to life. Aaltoes is one of the key players in the birth of startup culture in Finland. The society started to shape in 2009 when a bunch of students from Aalto University decided to start a co-working space. Soon they started Startup Sauna and the Summer of Startups (SOS) accelerator programs. Then, they organized Slush for the first time in 2011. The growth continues. Batch 2015 was formed out of over hundred teams competing to get into the program. Only 10 teams were selected for the program: Arctos.io, Prambag, Shadow Bug, Inde, Elffe, ThirdEye, Stone EDGE, Meiku&Me, World of Dianthia, and Grib. There was a lot of work done during the summer which was presented to all at Demo Day. That day, most of the teams came with a working prototype, and some had even proceeded to trials. Everybody was enthusiastic about their projects. Exactly what you would expect to see – people with dreams, passion, and courage trying to make it happen. Failing or succeeding can both lead to the same things: learning and success. Startup life is a chance for trying and helping to create the change we want to see in the world instead of waiting for it. The startup scene in Finland is not perfect, but it is, at this moment, one of the best in the world, and it is growing fast and getting better every day. It’s because we want it so. We want to make a better world, and we know we can do it much better if we help each other. That’s what you see on a daily basis if you are around the startup hubs in Finland. This is the culture that has evolved thanks to the places like Aaltoes. It is beautiful and powerful. Most people think that 3D modeling is something that only professionals can do because the tools and software products are complicated and time-consuming to learn. Grib can make 3D modeling so easy that even kids can do it. “I am a fond user of 3D modeling tools. I am aware of the limits and burdens of mouse/dimension based 3D drawing tools for the artists. Grib allows artistic touch to be applied and understood by the computer easily. If a mouse based tool was to be used, the process would take ages unless you are a pro” said Mukremin Balci, participant at Demo Day. Some people called Grib a “game changer” because it closes the huge gap between handcrafting and digital 3D modeling. Arctic Startup called it a “revolutionary concept”. Grib managed to project a vision successfully by demonstrating a combination of hardware and software with which users could create computer models using their hands. Holding a hardware device (a cylinder shape touchpad in this case) one can use gestures from the hand and fingers to send commands to a real-time software application that shows the creation. The device embodied pressure sensors that made the whole experience much more intuitive. When Grib was selected to join the accelerator, it was more like being given a shot to achieve its ambitious goal despite the complexity of the issue being tackled. But at the end, everybody was surprised when Grib managed to develop hardware and software prototypes and validate its concept in two months. The prototypes were displayed, a week after its technology was patented and tested (at a Collaboratory maker community in Gothenburg, Sweden), at Demo Day. It has been two months since graduating from the accelerator program. Grib has a concept, and we are full of ideas. Trends are changing fast, and there are new technologies on the horizon. One of the exciting things about innovation projects is this uncertainty. The best way to learn the path of your company and grow fast is believed to be by engaging users directly in the development process. We are going to share our vision with our potential users. If they share it, they most likely want to be part of it. That is when we can engage them. So, Grib has to be open to changes and pivoting. What we built was cool! However, the innovation lifespan may not last long. Judging by the trends, we expect some shifts, which means we may need to think of Grib as a software product and leave the hardware development. We are thinking about using well-established devices like mobile phones instead. Almost everybody has it; why not use it? Grib is looking for advisors and people with a network in the industry who can help develop their business. But most importantly, we need your help to build a greater product. And that’s why we would like to welcome you to join our community GribTown™.